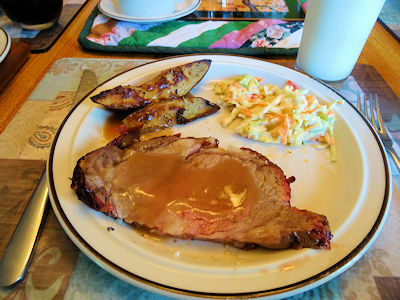 I made Prime Rib in the Louisiana Grills Smoker in the last post. I needed a side dish to go with them and we were not feeling great. Fortunately, She Who Must Be Obeyed love roast potatoes and the smoker was fired up anyway. Smoker Roasted Potatoes it would be. I started by cutting two large potatoes into six wedges each. I put them in a roasting pan and poured in enough oil to just cover the bottom of the pan. 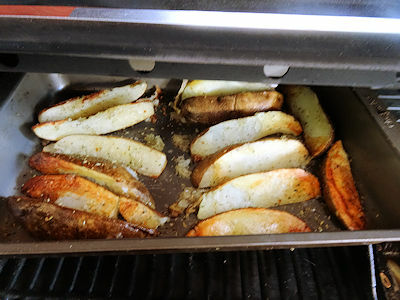 I tossed the potatoes in the oil and then sprinkled Italian seasoning mix over them. I put the roasting pan in the smoker which was set at 350 F. You could do these in a 350 F oven as well. I cooked the potatoes for 30 minutes and then flipped them and brushed them with oil. I cooked them for 30 minutes more and served them with the prime rib. These are crispy on the outside and creamy on the inside. A great potato to go with beef and gravy. Previous PostSmoked Prime Rib With Au JusNext PostFlowers, A Waste of Good Vegetable Growing Space? This is She Who Must Be Obeyed’s favourite potato and of, of course, she can’t be wrong! I love roasted potatoes. I’m going to try this recipe the next time we fire up the BBQ. I know. She Who Must Be Obeyed insists they are the best way to do potatoes. 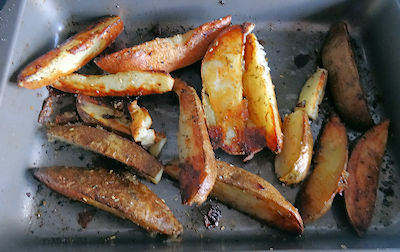 Love homemade potato wedges. They must have been fabulous with your prime rib!